A few quick thoughts on the 2015 Whidbey Island Pinot noir from Cultus Bay Vineyard in Puget Sound. Whidbey Island Winery was founded in 1986 when Greg and Elizabeth Osenbach planted their first grapes on the Puget Sound island. The winery was opened in 1992 and today they produce around 3500 cases with about half of their production devoted to estate grown fruit–including Madeleine Angevine, Madeleine Sylvanver and Siegerrebe. The Pinot noir is sourced from Gene Felton’s Cultus Bay Vineyard located on the southern end of Whidbey Island near Clinton, Washington–overlooking its namesake bay. Spoiled Dog Winery was apparently the first to plant Pinot on Whidbey with their first release coming in 2009, so I would assume the Cultus Bay plantings are younger. Paul Gregutt, in Washington Wines, describes Whidbey Island Winery as one the “rising stars” in the state. High intensity nose-a mix of black tea, rose petals, a little earthiness coupled with red fruit notes of cherries and currants. On the palate, the earthy notes become more defined as fresh forest floor with the black tea notes coming out even more. Medium-plus acidity keeps the fruit juicy and balances well with the medium tannins. The floral rose petal notes linger all the way through the long finish. The fresh black tea note in this Pinot is a delight! This is by far, the first Washington Pinot noir that has impressed me. While I said in my review of the Tagaris Pinot that at around $30-35 you are paying for the novelty of Washington Pinot, that is certainly not the case here. This wine more than holds up on its own with layers of complexity and beautiful balance–and from such young vines! In a blind tasting, I would have pegged it as something from a Burgundian minded producer in Oregon. Maybe the Chehalem Mountains or Yamhill-Carlton district. 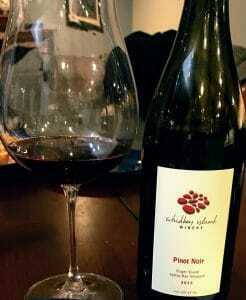 It’s not quite at the level of something like the Winderlea Shea Vineyard but it is one of the best examples of Pinot noir you’ll find in Washington. Tagged Chehalem Mountains, Cultus Bay Vineyard, Gene Felton, Greg Osenbach, Madeleine Angevine, Madeleine Sylvanver, Paul Gregutt, Pinot noir, Puget Sound, Shea Vineyard, Siegerrebe, Spoiled Dog Winery, Tagaris, Washington Wines and Wineries, Whidbey Island Winery, Winderlea, Yamhill-Carlton District.